I will address what “counseling” is not. Counseling is not “someone getting in your head”. Counseling is not someone doing something to you to produce a predictable result. Counseling is not witchcraft. Counseling is not laying on a couch and being psychoanalyzed. (at least not in my office.) Freud was a pioneer, but the therapeutic world has evolved. Counseling is not evil or a sin. 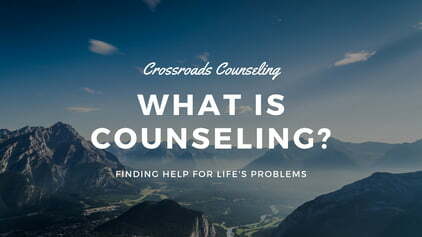 Counseling, however, does happen in everyday situations. And it can come in a few forms: it may come in the form of a friend or an online support group. It may come in a general conversation in a grocery store line or at the gym. It can come in sitting on the shoreline and listening to the waves and your own heartbeat or watching a sunset. Counseling involves the concept that every individual has needs that, over time, come to be expressed in a myriad of emotional Bx’s and /or negative coping skills. At some point, these behaviors become counter-productive on a daily basis or at the least, uncomfortable to the point of interfering with relationships, job performance, causing a lack of control in an area on a daily basis, or being affected by someone who displays these tendencies. These are merely a small portion of opportunities when a person may want to seek counseling. In a counseling session, a therapist will provide a broad-based assessment of a client’s current emotional, behavioral, and relational condition. In a counseling situation, the therapist should be informed of the client’s current medications and the effectiveness and/or side effects of the medication(s). The therapist should be open, approachable, and honest about his/her ability to address the client’s concerns. Needless to say, one might look for the therapist who optimally portrays the ability to provide a comfortable, stable, safe place to “park your soul” for a while. An involved therapist believes in celebrating the complicated individuals we have become while assisting to unravel what complicated relational situations we have created on the way. Counseling helps the counselee understand that there is comfort in knowing that someone can speak to their situation with authority. And, for the sports fans, counseling is a participation sport. The therapist should suggest “homework”. Let’s face it: if we lived in a perfect world, we would have accomplished the developmental tasks which would have prevented ours and others’ current lack of coping skills in the first place. -So a little practice is necessary to obtain the maximum bang for one’s counseling buck. “Homework” can come in the form of reading an applicable book, writing in a journal, and practicing some specific coping skills appropriate to your situation. One should enter into a counseling relationship (Yes, it IS a relationship.) with the idea of committing to at least 15 appointments. And, news flash: YOU ARE WORTH 15 APPOINTMENTS! There are four basic steps to recovery: 1. One-on-one counseling, 2. Group (12-step Group, Codependency Group, Al-Anon, Al-Ateen, Grief recovery, Overeaters Anonymous, Divorce Recovery, Church, A book club, etc…), 3. Having some friends for accountability, 4. Having a spiritual resource. Counseling is as effective as someone wants to make it. If you participate, it can also be a positive, life-changing experience for you on many levels, your family, and all the people whose lives you touch daily. For more information, please contact me or one of our highly experienced, qualified therapists at Crossroads Counseling & Consultation.